How to Make Halloween Themed Wedding or Event Flowers that are Not Gaudy! Fall is an excellent season for bright and punchy flower colors. Shades of orange, red, yellow, brown, and purple can make the most fun wedding or event designs. 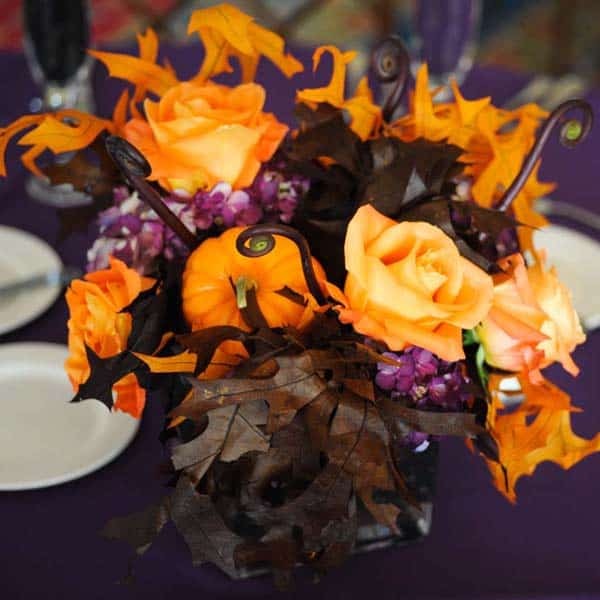 The problem is that sometimes when using the Halloween theme for event centerpieces, the result is a gaudy mess. Little plastic spiders, stickers, spider webs, and candy can make for fun designs for a child’s birthday but should stay home for the adult events! Adding natural touches(leaves and pumpkins) and sophisticated flowers to designs will designate your arrangements as elegant Halloween arrangements. (I never thought I would use Halloween and Elegant next to each other! But there is proof below!) Find out the ingredients in each of these wedding designs so that you can make your flower arrangements. The Halloween decor above is put together using spray tinted purple hydrangeas, stained fall leaves, orange fall leaves, mini pumpkins, fiddlehead fern, and orange rose miracle! 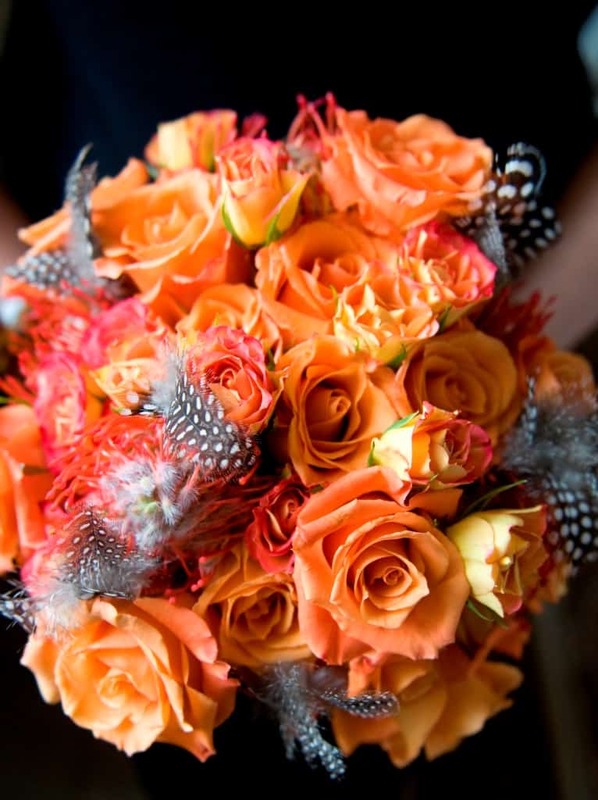 This Halloween wedding bouquet has so much SASS! The red tinted orange roses mixed with black and white printed feathers make such an edgy look! It is a perfect way to balance between corky, sassy, and classy for a fall wedding around Halloween! 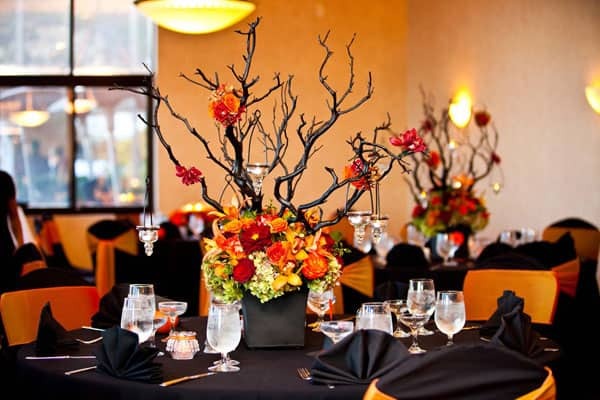 When making arrangements with the Halloween theme do not ONLY use orange and black. This will make for a very gaudy and predictable look. Instead, add some class to the design by introducing other natural fall colors such as red, yellow, green, brown, and plum. Adding one or more of these colors will create interest and class in the design. SKIP STICKERS, PLASTIC SPIDERS, and CANDY to make an elegant Halloween look! What are your suggestions for making tasteful Halloween themed fall designs?